The Tugur valley below the Assyni River mouth Tugur is the first rather big river drainage to the north from Amur. The main source of Tugur is slow Konin River with colored water, flowing from north to south. Konin is getting its mail tributaries from the west: swift, clear Munikan and Assyni Rivers. Below the junction with Assyni Konin is changing its name to Tugur; in this area it is making sharp turn for almost 180 degrees and flows to the north-north-east. In this area the lowland river is changing its nature and becoming braided and swift. Some of the channels in this area are blocked by huge log-jams, which are dangerous for rafters. In the mouth of Tugur River there is a tiny native (Evenk) village of the same name. Tugur is famous with its Siberian taimen stock; the species is quite abundant in the drainage. Tugur has big potential for trophy and record taimen. This unique stock of taimen during summer and fall feed on adult chum salmon. Because of food abundance this predator can reach huge size: there are trustworthy data on 60-70 kg specimens. A pleasant by-catch are 2 species of lenok, Amur pike, Amur grayling, chum salmon, and whitefish. The Tugur River is for sure the best taimen stream of the world. The entire river drainage is under a long-term lease; the owner has some camps and keeps the guards. The Tugur River is now well protected, it is the only salmon river in the Far East with no caviar poachers. Abundant food allows taimen to grow big — in September 2011 the 168 cm fish with 84 cm girth (52 kg) was landed here. The fishing is strictly catch-and-release. The last time when I was able to visit the Tugur was June 2010. We had no luck with the weather; it was raining almost every day, and the water was murky and rising. With difficulties our group was able to land several good fish. Due to high water the work was hard — in 5 days I had only 1 taimen bite. I was lucky — it was a 137 cm, 29 kg fish. I was using 15’ two-handed rod and 13 cm long articulated-type streamer (kind of a String-Leech). 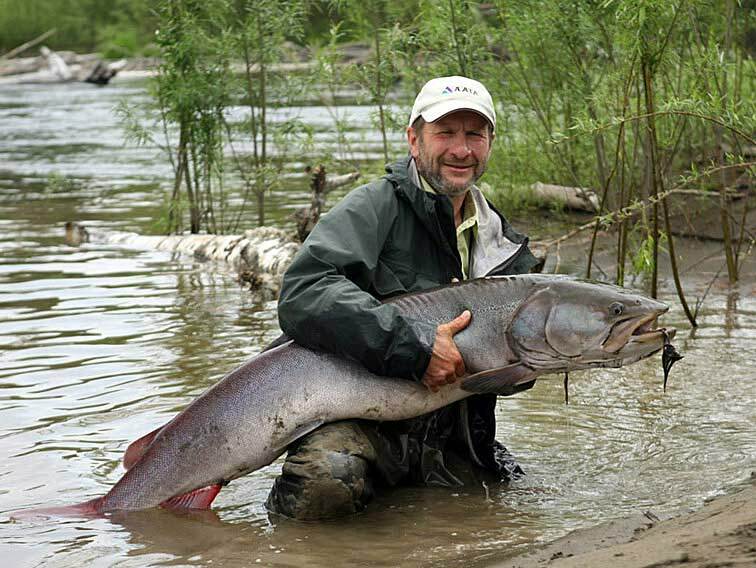 Next week in June a 40+ kg fish was landed in the Tugur River, and in September 2011 — a 52 kg taimen (the both — with a spinning-gear). In the floods the fishing requires lots of patience from the fishermen; the guides have to be skillful and strong. The main channels of the Tugur in floods look like big deep streams. It is hard to find the fish lies in such water. Lower-Amur grayling — this species is always small. The same taimen: the fish will be released in a minute. 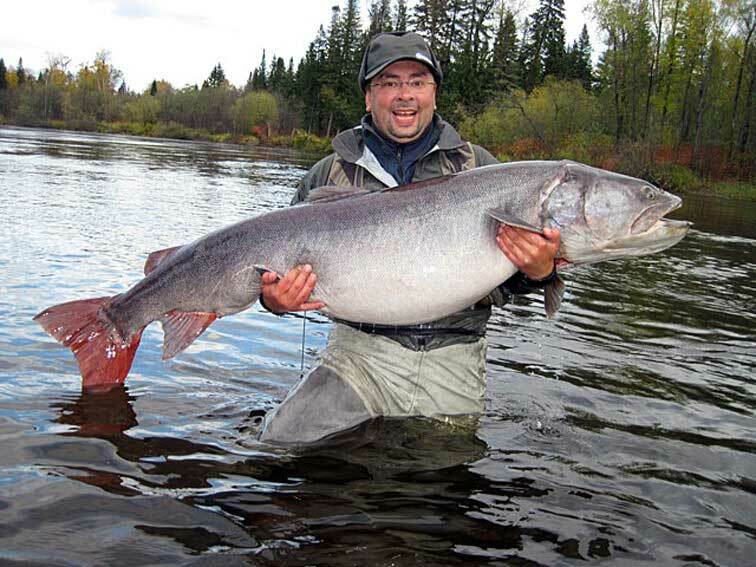 168 cm fish with 84 cm girth landed in the Tugur in Sep 2011 (spinning gear, photo of Oleg Abramov). The weight (52 kg) was calculated with a formula Q=45xLxGxG; Q = weight, kg; L = length, m, G = girth, m.